Blanket Octopus is the common name used for the currently 4 described species of the Tremoctopus genus. Blanket octopuses live throughout the world's tropical and sub-tropical oceans, occurring from the surface to moderate depths. Tremoctopus gelatus is easily recognized by its gelatinous consistency and generally pale pigmentation, while the other three species are very similar and difficult to recognize. These octopuses exhibit an extreme degree of sexual dimorphism. Females are large and muscular and may grow to over 2 meters in total length. On the other hand, males are very small, reaching a length of only 1-2 cm, not even an inch! They are best known for their long transparent webs that connect the dorsal and dorsolateral arms of the adult females whereas the other arms are much shorter and lack webbing. Males develop a specially modified third right arm used for storing sperm. This structure is known as the hectocotylus. 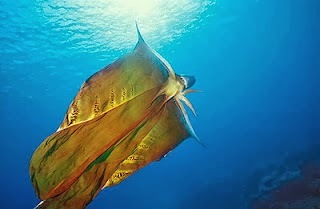 Contrary to most octopuses, the blanket octopus does not use ink to escape predators. When females are threatened, they unfurl their large net-like membranes that spread out and billow in the water, greatly increasing their apparent size. The Mediterranean spearfish (Tetrapturus belone) and the swordfish (Xiphias gladius) are known to feed on the various tremoctopus species. During mating, the hectocotylus is detached and crawls into the mantle of the female to fertilize her eggs. It is assumed that the male dies after a while. Females usually carry well over 100,000 and up to 150,000 tiny eggs which are attached to a sausage-like calcareous secretion that is held at the base of the dorsal arms. They are carried by the female until hatching occurs. - Pickrell, John (Aug. 12, 2003). "Walnut-Size" Male Octopus Seen Alive for First Time. National Geographic News. - Jones, E. C. 1963. Tremoctopus violaceus uses Physalia tentacles as weapons. Science 139: 764–766. - Thomas, R.F. 1977. Systematics, distribution, and biology of cephalopods of the genus Tremoctopus (Octopoda: Tremoctopodidae). Bulletin of Marine Science 27(3): 353-392. Not enough information like how much it weighs, what is it length, and what body parts are used for survival, and Body covering used for survival and actions done to survive and Fun facts!!! i RATE IT 4 AND A HALF STARS!! !